While the number of new ships being launched is ever increasing on the world’s rivers, so too is the luxury on board, with nearly every newly launched ship created squarely for the demands of well-heeled customers. 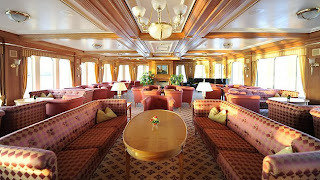 Lounge on board River Cloud. SPACE AGE Luxury often equates with space, and more on-board space has been partly achieved by adroit design changes that coax more room out of ships limited in size by locks and low bridges, especially in Europe. Hair salons, 20-seat cinemas and (in Uniworld's and AmaWaterways' new ships) heated rooftop swimming pools have been added. River Cloud (which has 36 crew for just 90 passengers) fits in a putting green, fitness zone and library. Tauck’s new Inspiration-class Inspire and Savor now offer suites with walk-in wardrobes and marble bathrooms with double vanities. Table La Rive dining on Scenic Space-Ships. EYE TO DETAIL With size ultimately limited, however, luxury increasingly expresses itself in the detail (in-cabin espresso machines, mini-bars, branded toiletries) and the dining experience. 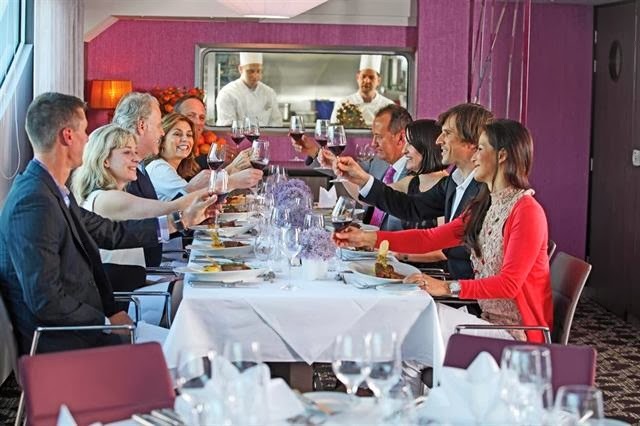 Scenic’s Space-Ships feature degustation dining at separate Table La Rive restaurant, and AmaWaterways (APT) is introducing a chef’s table on its new ‘Royal Experience’ cruises in 2014, during which 24 guests watch the chef prepare a six-course degustation menu, accompanied by fine wines. The new ‘Royal Experience’ in Europe-wide cruises include visits to Michelin-star restaurants, truffle hunting and the chance to dine with a real princess, Heide von Hohenzollern, in a castle in Andernach in Germany. PEACE AND QUIET In luxury of another sort, the river journey is becoming more tranquil, with new Viking River Cruises ships built with innovative designed engines and four propellers (instead of the usual two) to reduce vibration and noise. As an added bonus, one engine can be taken off use for maintenance while the others take up the slack. Have something to add about the increase in on-board luxury? If so, why not leave a comment. Our readers appreciate your feedback.